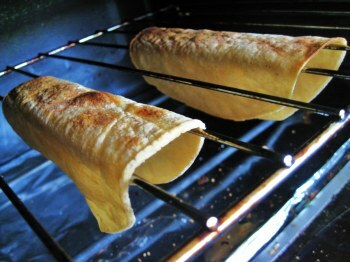 Bake Tortillas Into Flat bottom Taco Shells in your oven! Over at eating well they've got a great idea for creating those flat bottom taco shells in your own oven! All you do is nuke some tortillas in the microwave for 30 seconds, wrapped in a moist towel or paper towel, then set the oven at 375 degrees and bake the tortillas for 7 to 10 min.